My art show upstairs at Pleiades Gallery in Durham April 4-28 will look back at my microbiology roots. 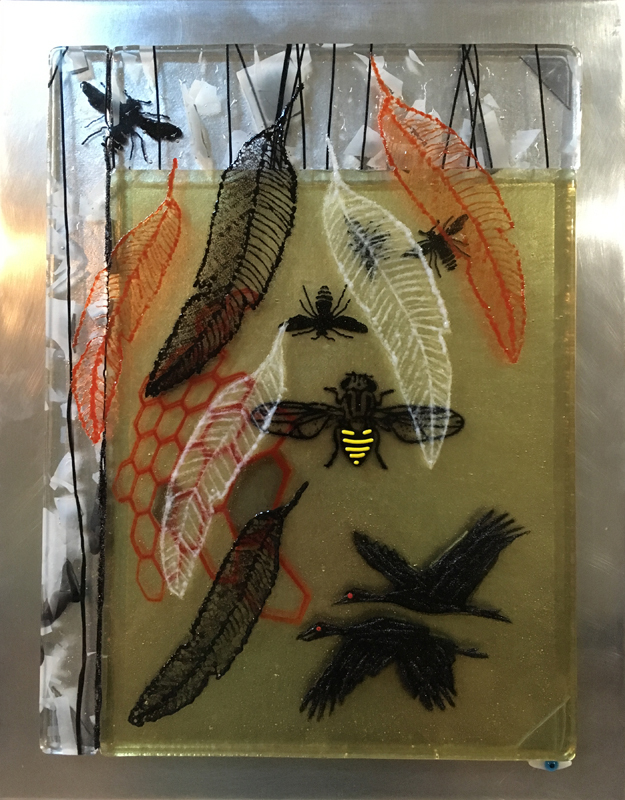 I will also have a guest artist joining me, Jane Hartman, who also fuses glass with a microbiology theme. 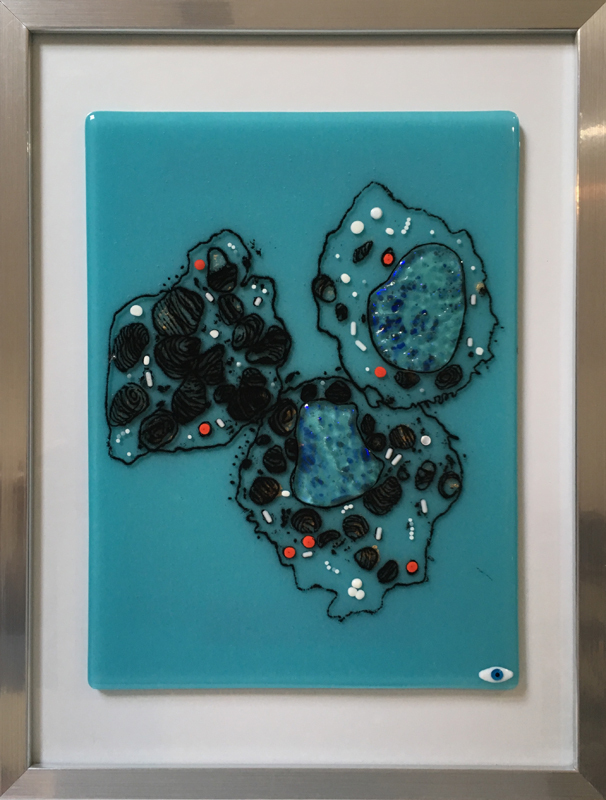 One of my pieces, shown here, is based on my research on lung cancer and toxicology. It shows isolated alveolar type II cells that have unique lamellar bodies that make surfactant so that the airways don’t stick together and make it impossible to breathe. I just finished a new piece called “Chemistry” for our themed exhibit coming up after this weekend. It was fun making 4 inch tiles that all contain the secret ingredient (hint- it’s not glass). Come see the show in person. It begins on January 31. I’m working hard to build a new “solo” show about the microcosm for Pleiades Gallery in April. 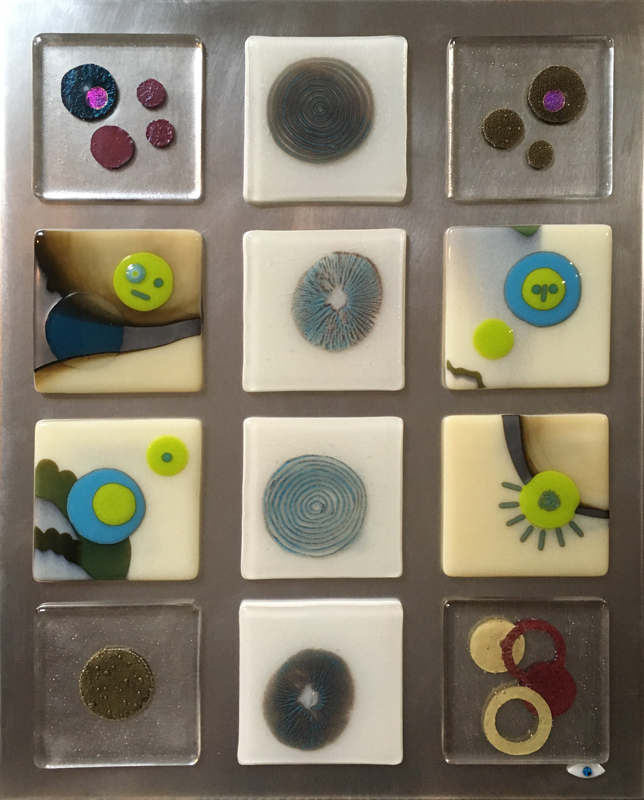 Actually, I will host another fused glass artist friend, Jane Hartman, who also creates glass art with microbiological themes. In my spare time, (like in front of the boring TV news), I’ve been playing with my new toy from Santa (that is myself), a slightly newer iPad with a really neat Pencil. I took a little class over at the Apple Store on the Pencil and purchased a program called “Procreate” for $10, which is really fun. Here is a little of my doodling. 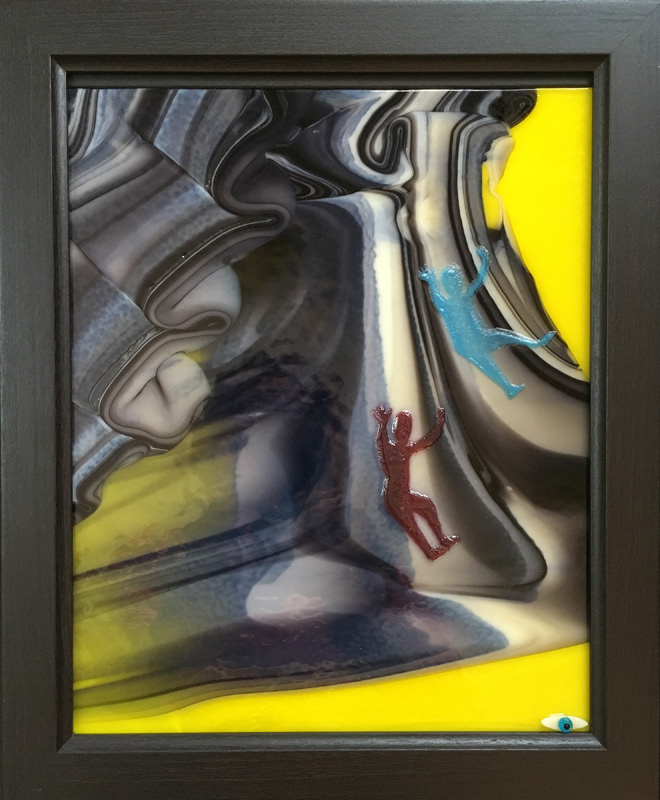 Next month I’ll try to have some of my new glass mounted and photographed. I’m madly trying to clean up my studio for visitors and finish a few pieces that are in progress. This year has been full of fun, and my head is full of ideas. Here is a new piece that is on exhibit this month at Pleiades Gallery. I’m a little behind on posting due to travel and house renovation projects. Now I’m getting ready for the Carolina Designer Craftsmen Art Market at the Raleigh Convention Center Nov 2 (2-8pm), Nov 3 (10-6pm), and Nov 4 (11-4pm). I will be at booth A3, and I will be giving a demonstration/presentation on fused glass powder printing there at 3pm on Sunday. 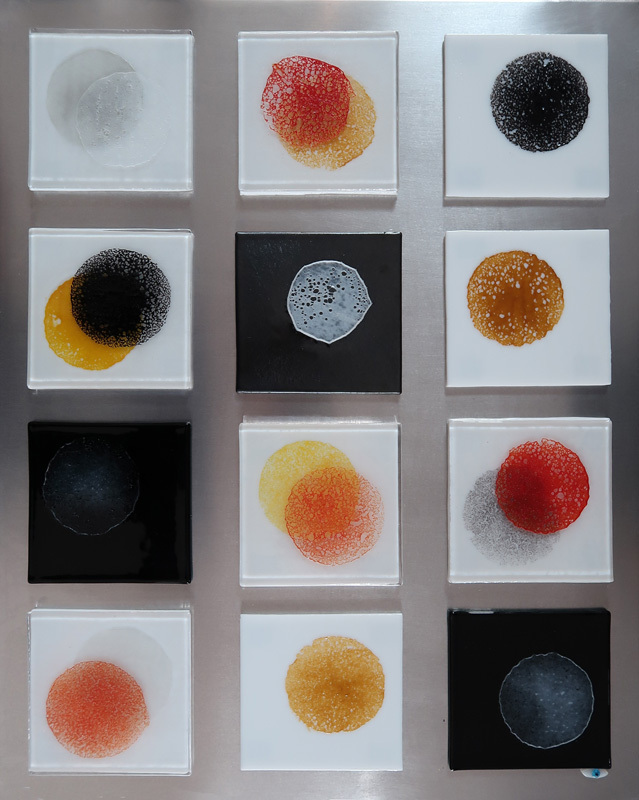 Here’s an image of glass powder prints that were printed with the same colors but fused at different temperatures. They are different texturally too. One of my favorite shows is “Come Out and Play” at Jim-Gin farm in Chatham County (Jones Ferry Road about 5 miles south of Chapel Hill, NC). The opening weekend is August 25-26 from noon til dark. It’s a big party with great art, mostly outdoor sculptures, food, drink, music, community, fun. Check out details at Come Out and Play on Facebook or Google. Debbie Meyer, Eric Brantley, and Debbie’s parents, Jim and Ginger Meyer, sponsor the show, and it is really fun. Hope to see you there. 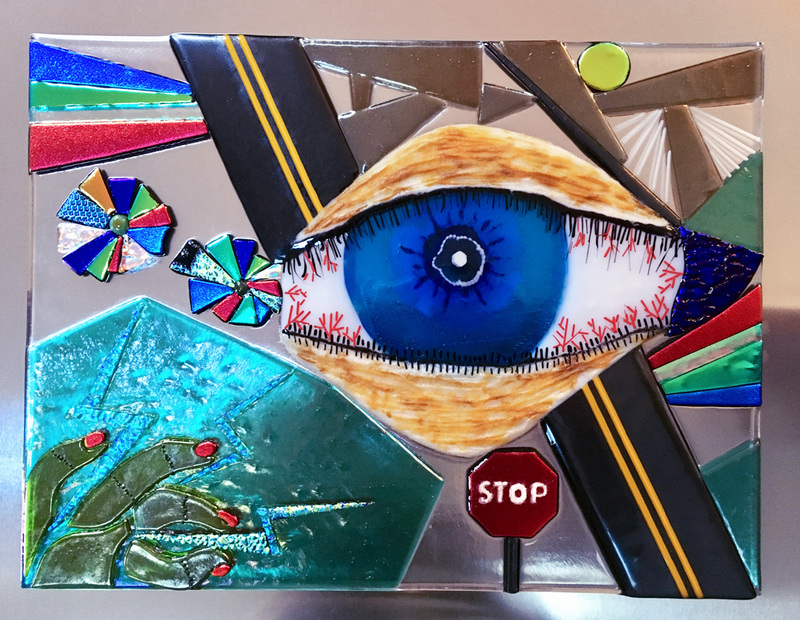 After several weeks of travel and taking tons of photographs, I am inspired to create more glass art for this show and future exhibits later in the fall. 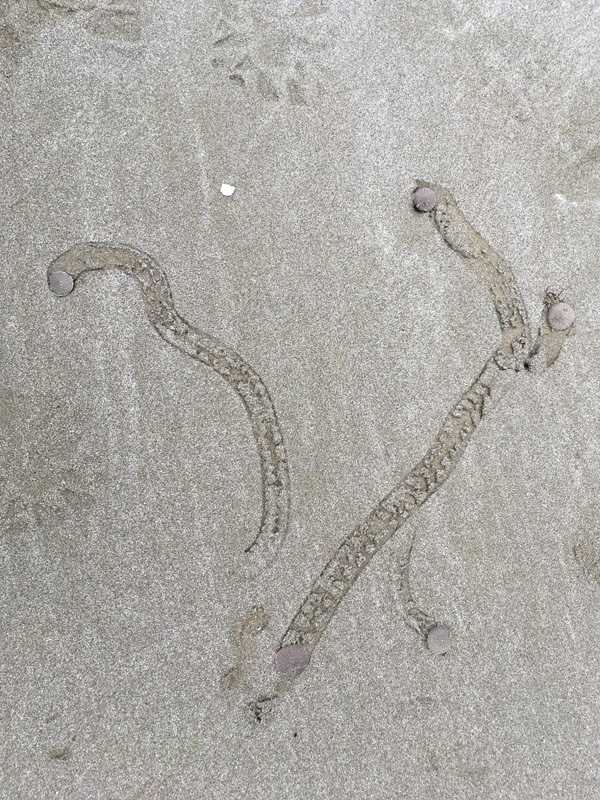 Here is a photo of sand dollar tracks I saw on the beach in Oregon last week. I haven’t ever seen this phenom before. Not sure about this, but several photos may work their way into my glass art. Over the past year I’ve been more than tempted by certain Bullseye Glasscadia special production glass that I see at Carolina Stained Glass. Of course some I have to have, especially if I imagine something that could emerge from the design in the glass. 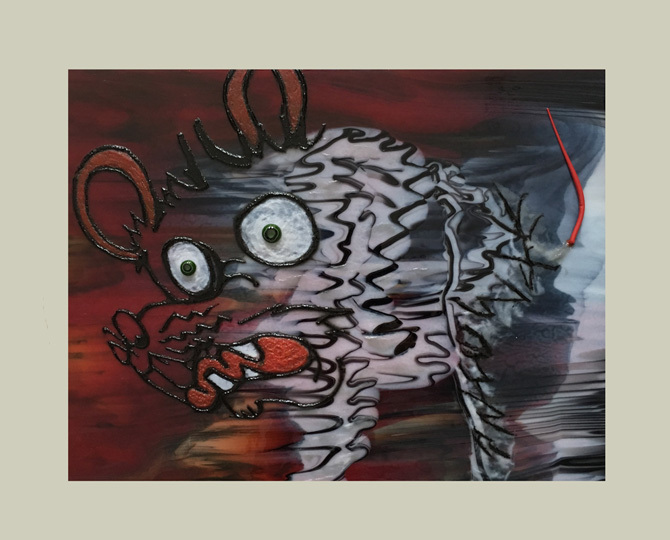 That’s how my latest piece “Mad Dog Graffiti” arose. Check out the Glasscadia section of my Gallery to see more. Summer seems to be here already with temperatures over 90 in mid-May. What can we expect now for real summer? 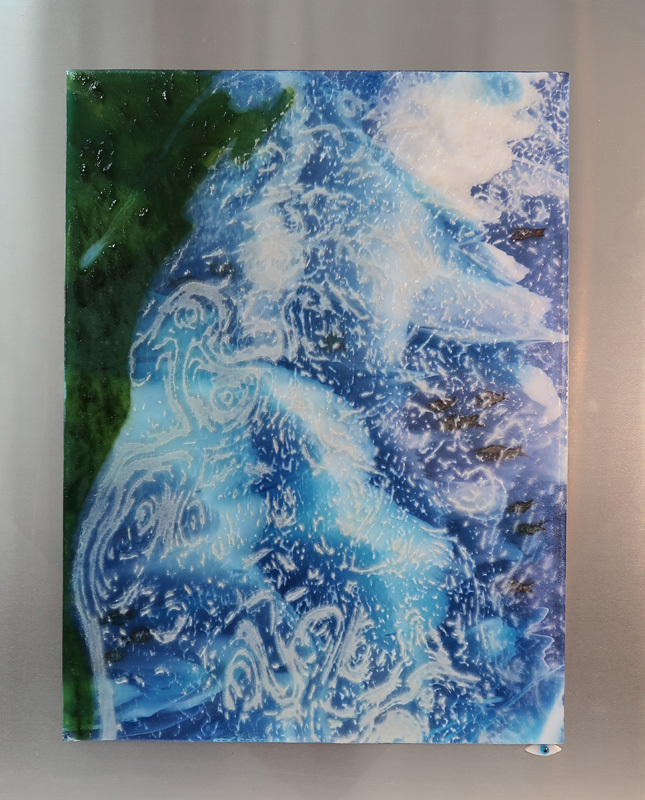 At least for a while, I am spending my studio time creating fused glass powder prints. They don’t heat up the space as much as longer fusing schedules. Here are some images from a piece that I hope is in the kiln for it’s final fuse. The first fuse is the mountain, sky and lake on a white background. Then I printed spring flowers on clear glass (second image). The final step is to fuse this onto the background. I used clear glass powder between the layers to eliminate (hopefully) bubbles that occur between the layers. Now the anticipation! More about this technique is in my new MENU category on Techniques. I’m not in a jokey mood, and I know it will be better in 7 months and 6 days. But I won’t go there today. The best I can do is my new funny little piece called, “Racing for fried burgers with Boom-Boom sauce”. I hear it’s a real order at a local restaurant. Tomorrow is our new installation at Pleiades Gallery in Durham called Changing Worlds about the environment. My new piece for this show is called, “The Current Situation” about the Gulf Stream and its association with climate. I hope I’m moving forward with my art and not creating the same old thing as last year (thinking about Ground Hog Day, the movie)! I did work more on creating a variety of thin “holey” wafers and finished one project, called Phase Shifts, using them. I’m still working on some more “microbiological” reticulated/web-like or networked wafers. In the mean time, I also just finished a piece for the new themed show, “Electric Avenue”, opening next week at Pleiades Arts in Durham. If I don’t get too much done creatively, it might be that I’m now on the Board of Directors of the Carolina Designer Craftsmen Guild working on the show committee, and I’m helping with the grants committee at Pleiades Arts. These are kind of daunting tasks for me, especially as I’d rather be playing in my studio.